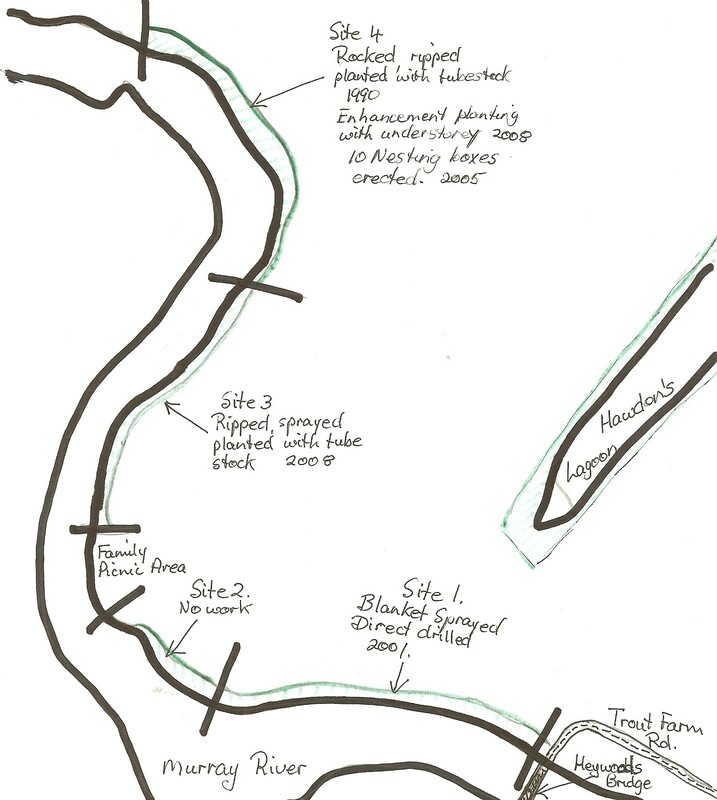 This brief note documents some riverbank plantings on Hawksview and evaluates their effectiveness in relation to biodiversity aims. 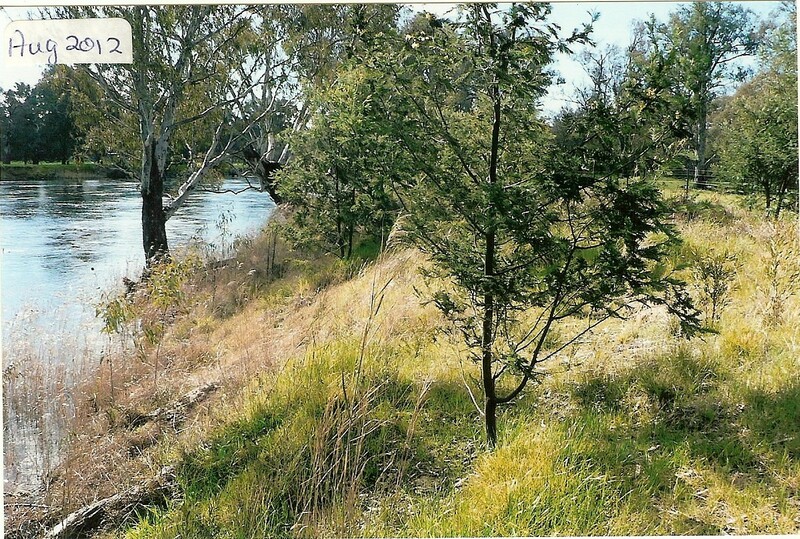 Plantings occurred in stages along the NSW bank of the Murray River, below Heywoods Bridge. 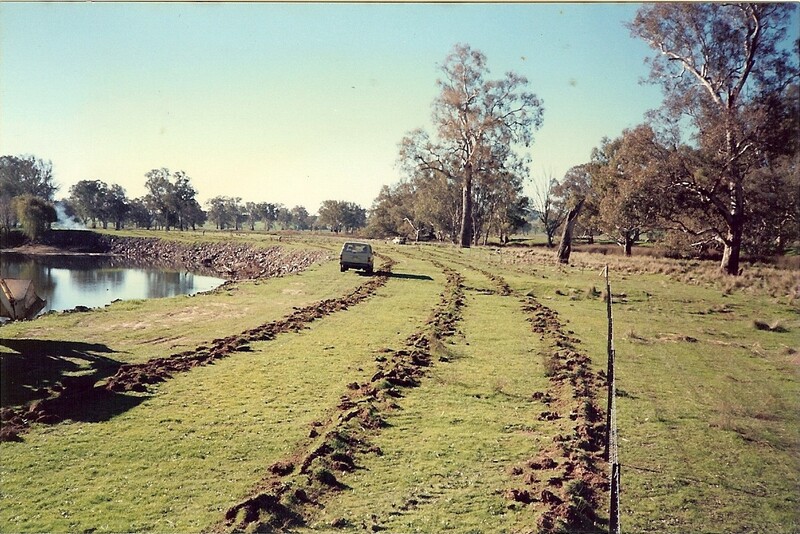 Riverbank Erosion Control works were undertaken on Hawksview in 1990. Funding was by the NSW Dept. of Water and Energy. 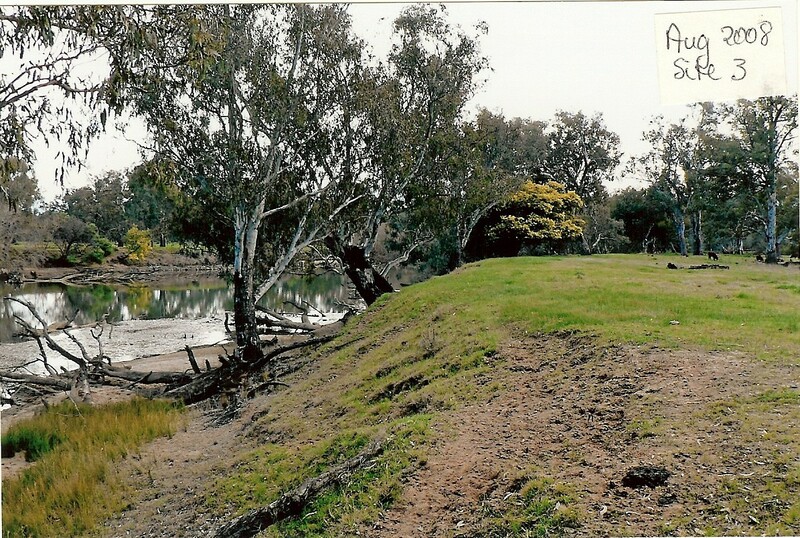 Large rocks were placed along a bend in the Murray River approximately 1600 - 2000 m downstream from Heywoods Bridge (Site 4, location map). 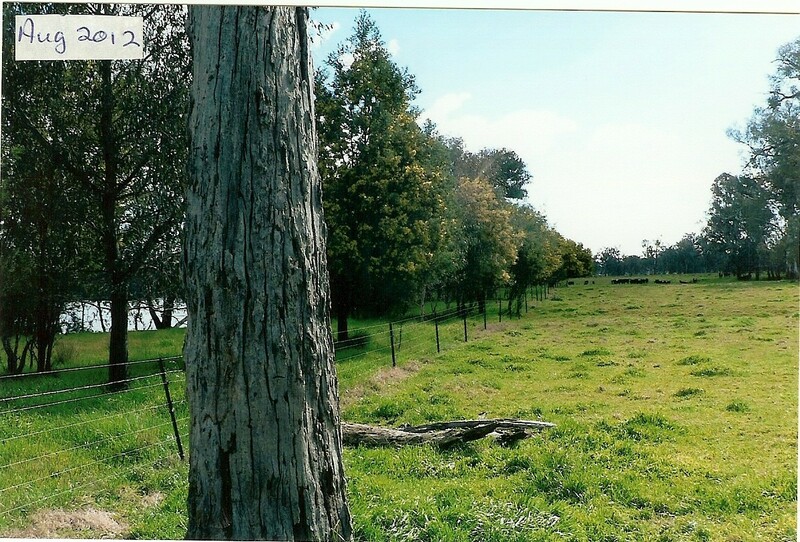 The 15-30m wide strip was fenced, ripped and planted with tube stock to predominately River Red Gums, some Silver Wattles and a few River Bottle Brush. 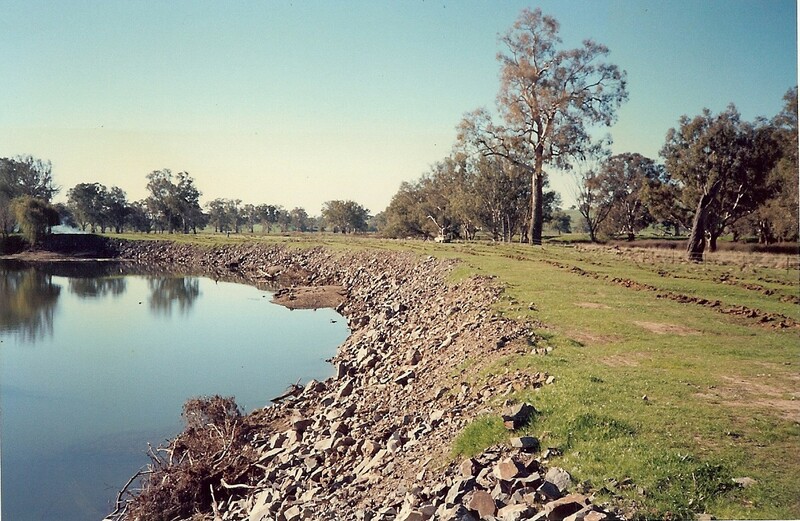 The aim was to stop further river bank erosion due to high water flows from Lake Hume (see photos 1 to 3 below). Note the large dead trees (stags) in all photos, particularly, photo 3, that we noted on 06/01/2014. 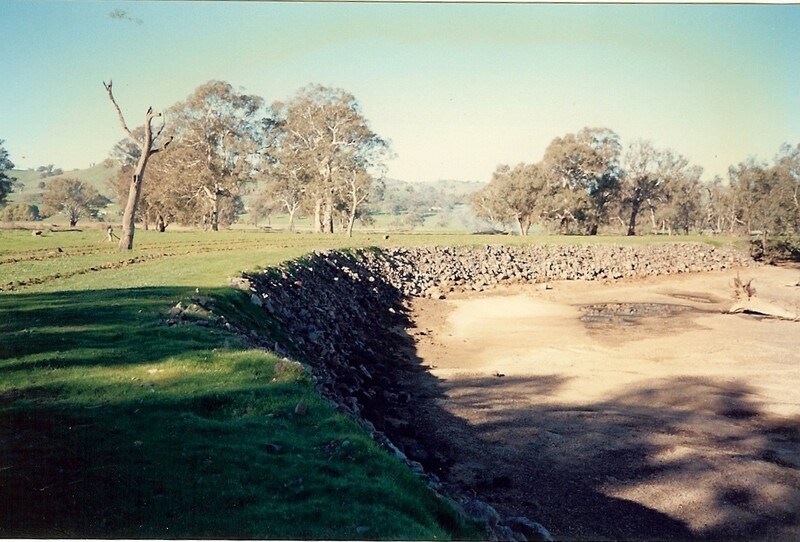 Photo 1: Site 4, rocked site, ripped and fenced, looking downstream (1990). Two more riverbank sites were established. In 2001 Site 1 was fenced, blanket sprayed and direct drilled and in 2008 Site 3 was fenced, ripped and planted with tube stock. Site 2 was left out as the river bank was deemed too steep to effectively fence off. These areas were part of the Murray River Stream Bank Restoration Project. Funding was again by .NSW Government Department of Water and Energy. It took 2-3 years for the vegetation to establish in Site 1 and the resulting cover is good despite cattle getting in soon after germination when the river was low. 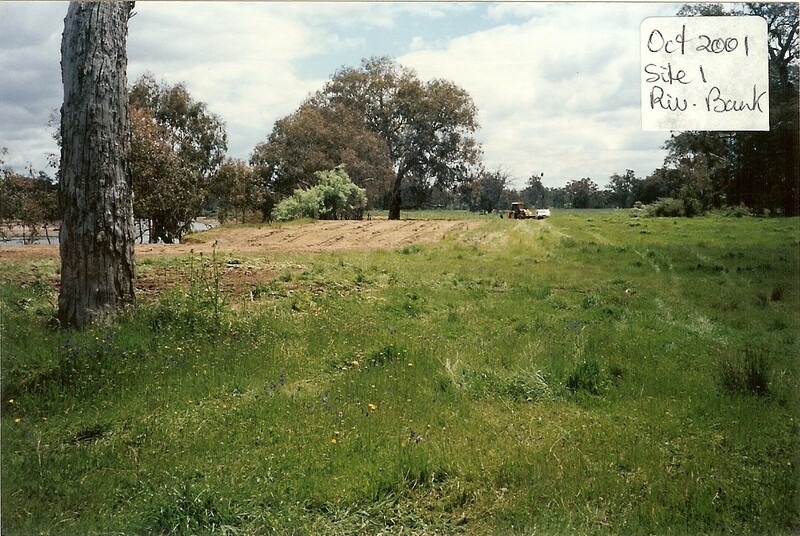 In 2008, some understorey enhancement planting with tube stock was also undertaken at the original 1990 rocked site. Photos 4 & 5 Site 1 Before and after restoration. Photos 6 & 7 Site 3 before and after restoration. Ten (10) nest boxes were acquired from the National Environment Centre (NEC) Thurgoona for installation in Site 4 in 2005 with the aim of further increasing biodiversity. These were installed by Woolshed Creek Landcare Group members and other volunteers. The boxes had two sizes of holes, small and larger, and were designed for birds. We were also hoping that Sugar Gliders might use them. They were nailed to tree trunks at a height of 2-3m. The boxes were checked during the Thurgoona Bioblitz in 2012 and again on 6 Jan 2014. Results of the nest box monitoring done in Jan. 2014 are shown in Table 1. The sites are more attractive to wildlife now that there is a good range of understorey and wattles for a food supply. At least 4 River Red Gum seedlings could be planted next winter at Site 2 using stock proof tree guards to eventually provide a corridor for Squirrel gliders between Sites 1 and 3. Nesting Boxes could be put in them in 5 – 10 year’s time. All sites now are considered a major biodiversity improvement and a valuable riparian link adjacent to aged River Red Gum open woodland.